The Horse and the Elephant are two animals particularly prized in our country's history. War horses and War Elephants have brought their contribution to victories gleaned in wars against invaders. Two organisms have been founded for their care, their food and their training : there were the Institut of Elephant and the Institut of Horse. In the year of 1509, Emperor Lê Uy Mục had established two Inspection Offices of Royal Elephants and of Royal Horses. The Ancients have discerned clearly the rôle and les responsabilities of administrators, officiers s'occupant of each category of Horses. They have elaborated functions of Médecins Zoologues for les soins and les guérisons des Horses, for helping them to aider à mettre bas, like Vétérinaires spécialistes des Chevaux d'aujourd'hui. Since the Mongolians Nguyên - Yuan had invaded our country for the first time in the year of 1257 and another times in 1285 and in 1288, thousands and thousands of war horses from north mongolian steppes have been transported into our nation. When the defeated Mongolian troops had fleed, a certain number of these war horses have been captured, the another have been lost in the forests and became wild horses. Our national horses had crossbred with horses thoroughbred lfrom mongolian steppes, from Vân-Nam - Yunnan, from Kinh-Bắc (North China), from Ferghana (Tân Cương) that our northern ennemies have taken in their militaries campaigns throughout several invasions. War Horses differ very far from Horses used for communications des informations and distinguish still more with Pack-Saddle Horses and Carthorses (Drafthorrses).... War Horses were selected from categories of « Kỳ »(騏) horses and « Kí »(驥) horses which were little-known, precious and rare horses ; it was the category of Battle Horses. While « fearful horses - ngựa Nô», « base horses - ngựa Đài » used for the transport ; there was « horses of pack-saddle - ngựa Thồ ». Outclassing all precious horses are those reserved to Emperor and Generalissimos going to the front. The thoroughbred War Horses the most prized by Far East Generalissimos in the bygone days were often those of horses called « Thiên-Lý-Mã » (Horses covering thousand of miles), as the one of « Horses sweating blood » (the Akhal-Téké), or those of Arabian Horses, called «Heavenly Horses - Thiên-Mã», as the Iranian Jaf and the Arabian Purebred, imported from far countries (Ferghana, Turkménistan, Persian-Sogdian) by the Silk Road. The War Horses request 4 Paces of Galop and 3 Levels of Jumping Height, and they request 9 Qualities. They are divided into 8 kinds of Brilliant Horses. Among specifical names used for designing colors of coasts, shapes or characteristiques of medieval horses in our country, as in China, there's a certain number of following terms : «Horse - Mã»(馬), «Hare -Thố» (兔), «Dragon - Long»(龍), «Foal - Câu»(駒), «Hooves - Đề(蹄), «The Excellent Kỳ»(騏), «The Robuste Kí»(驥), «The Fearful - Nô (駑), «The Base - Đài» (駘) for naming horses and there's a certain number of adjectives as : «Splendid - Tuấn» (駿), «Cheerful- Lạc» ((樂), «Precious - Bảo» (寶), «Well-Built - Phiêu» (膘) for qualifying them. 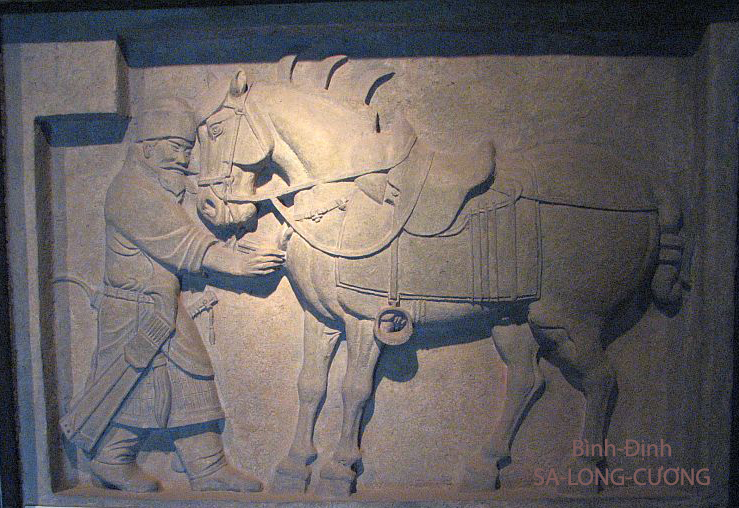 When we talk about War Horses, we can't leave out to speak about two famous battle horses : there were « Song-Vỹ Hồng » of illustrious generalissimo Lý-Thường-Kiệt (1019-1105) and « Nê-Thông » of emperor Trần-Duệ-Tông (1372-1377). «Song-Vỹ Hồng» (Chestnut Horse with Two Tails) was a War Horse with the Golden Chestnut Horse coast with a long tail of two colors : golden chestnut color and washed-out color on both sides. When it galops, it seemed like a divine horse with two tails, so it was called « Song-Vỹ Hồng », that meaned «Golden Chestnut Horse with Two Tails». It was the war horse of llustrious generallissimo Lý-Thường-Kiệt (1019-1105), famous vietnamese general having pacified the Champa, having fought the Song ang having conquired the two most great southern provinces of China. «Nê-Thông» (Night-Blue with Metal Mud-Grey Highlights horse) was a splendid horse having an extremely rareful and precious coat, with the truthly marvellous mixing of three colours of white, black and Night-Blue. There was the battle horse of king Trần-Duệ-Tông (1372-1377) during the punitive strike conducted by this emperor himself against the Champa in 1377. 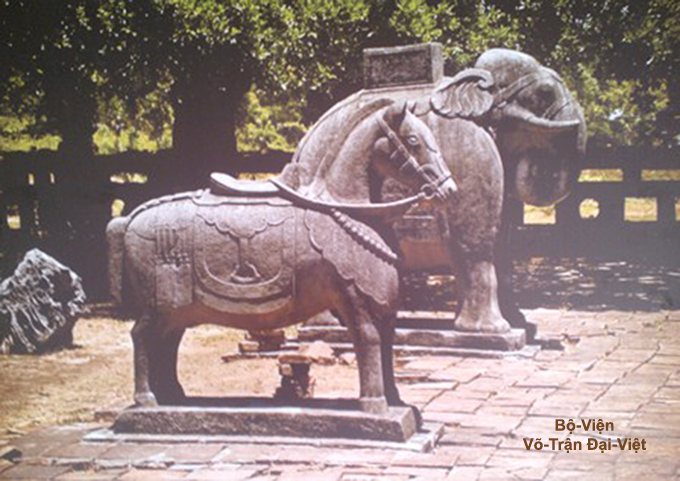 1 – The « Bạch-Long Câu » of king Thái-Đức Nguyễn-Nhạc : a magnificent powerful horse with long leggs, slender body and beautiful silhouette. His coat is white as snow, his mane and his tail are long with fine hair as of the silk. It runs swift as the wind, with a light pace as it flews. 2 – the Xích-Kỳ (a horse from northern steppe, tribut offert by Khmers), which was owned by king Nguyễn-Phúc-Khoát and took as war booty by Amiral of the Left WIng Army Nguyễn-Văn-Tuyết. It's a Cherry Bay Horse, with a mane and a tail as black as jais. 3 – The Ô-Du of Generalissimo Đặng-Xuân-Phong, Ebony Black Horse, still called Travelling Crow-Black Horse, with leggs as thin as those of dears. It walks carefully and supple as a tiger ; in galop, it runs so fast that you'd think it flews. 4 – The Ngân-Câu, an Akhal-Teke of Lady Generalissimo Bùi-thị-Xuân. It's a powerful and tall white horse . 5 – The Hồng-Lư, an another Akhal-Teke of celebrious Generalissimo Lý-Văn-Bưu. It's a splendid Chestnut Horse. At the first view, it appears as an ordinary horse, with long legs holding thin feet, svelte silhouette revealing his ribs as a starving horse. But when we watch it well, we see that it owns particular traits, with a mule's head. It has a capricious nature, indomitable and only his master can riding it with facilities. His neigh always terrorize other horses and scares them off. - The War Horse of Bằng-Châu is the mount of Mr Đinh-Cương at Bằng-Châu (sous-préfecture of An-Nhơn), grand uncle maternal of three founder brothers of Tây-Sơn. It's a horse with white coat as the snow, with eyes which are red as ardent coal, speed like the wind, being able to cover thousands of lieues. It's broken in for crossing up aw well rivers as fire under the order from his Master. It knows returning in the military base for annnouncing the detress messenger from his master on the battle field, by neighing and pawing the ground. - The Even of Horses Linh-Phong (Vents Sacrés) is constituted by the Chesnut Horse of Generalissimo Mai-Xuân-Thưởng (1860-1887), Leader of political movement Cần-Vưong in opposition against french force of occupation, and by the Black Ebony Horse of Commandeur Trần-Tân. These two horses, descendants of those from northern China, are of an extreme loyalty with their recpective master, go always together and get on wonderfully. From these seven horses, two most prized by emperor Minh-Mạng of NGUYỄN's Dynasty were an Arabian Purebred baptized « Thiên-Mã » (Heavenly Horse), imported in 1830 and « An-Tường-Ký » i.e. «Excellent Horse going at an Amble». The precious Horse Kantaka was kneeling down and bending one's head for making farewells to Prince Sidharta. - The famous Akhal-Téké « Xích-Thố - 赤 兔 - Red Hare », ridden by the Generalissimo Duke Quan Vân Trường - 關 雲 長 (162-220) in the Three Kingdoms Period. - The famous war horse « Hoàng-Phiêu - 黄 膘 - Well-Built Horse » of Generallissimo Tần Thúc Bảo, became illustrious with his dexterity in the Blade-Breaker wielding, under the TANG Dynasty.
. «Trảo Hoàng Phi Điện - Yellow-clawed Flying Lightning » (Zhuahuang Feidian - 爪 黄 飛 电). - The exceptionnels horses « Thiên Lý Phong » (Qian Li Feng - 千 里 風) and « Vạn-Lý-Vân (Wan Li yun - 萬 里 雲» stealed from Bác-Vương (Pa Wang - 博 王) by Mạnh-Lương (Mèng Liáng - 孟 良). - War Horse with Dark-Chestnut Cherry Bay coat, ridden in the military campaigns against warlords Vương Thế Sung (Wang Shi Chong - 王 世 充) and Đỗ Kiến Đức (Dou Jian De - 竇 建 德), during 620-621. - Piebald War Horse with Blue-Grey glints coat, ridden in the military campaign against Đỗ Kiến Đức (Dou Jian De- 竇 建 德), in 621. - Dun War Horse with White-speckled Yellow coat, ridden in the military campaign against Tống Kim Cang (Song Jin Gang - 宋 金 剛), during 619-620. - Dun War Horse with Black mouth and Curly mane, ridden in the military campaign against Lưu Hắc Thát (Liu Hei Da - 刘 黑 闼), in 622. - War Horse with Black coat and white hooves, ridden in the military campaign against Tiết-Nhân-Quý (Xue RenGui - 薛 仁 貴), in 618. 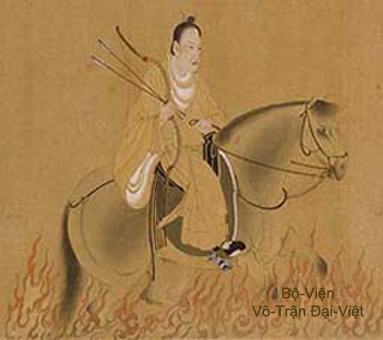 - Crimson Chestnut War Horse, ridden in the battle for Lạc Dương (Luoyang - 洛 陽) against Vương Thế Sung (Wang Shi Chong - 王世充) of Tùy (Sui - 隋) Dynasty (581-618). Táp-Lộ-Tử (Sa Lu Zi) in the low-relief is the only war horse represented with a man standing beside ; this is the general Khâu-Hành-Cung (Qiu Xinggong 丘 行 恭 ) pulling an arrow out of this celebrious war horse's chest. « The Figures of Bình-Định » ("Nhân-Vật Bình-Định"), from Lộc-Xuyên Đặng-Quí-Định, Ed. of the Author, 1971. « Martial Arts Men of Bình-Định » ("Võ-Nhân Bình-Định"), from Quách-Tấn and Quách-Giao, Ed. of Youth, Ho-Chi-Minh City, 2001. « The Tây-Sơn Stars » ("Những Ngôi Sao Tây-Sơn"), from Nguyễn-Văn-Nhân, Ed. of Arts, Ho-Chi-Minh City 2001. « The Five Divine Horses of Tây-Sơn » ("Ngũ Thần-Mã Tây-Sơn"), from Thái-Tẩu. « The Pleasure To Read Chinese Historical Novels » ("Thú Xem Truyện Tàu"), from Vương-Hồng-Sển.